With Father’s Day fast coming up, Neo have written to us and offered us the perfect gift for your dad, the chance to help him quit smoking. One of our lucky readers is in with a chance to win the Neo Charge Bundle. Power up your Neo anytime, anywhere with the new Neo Charge. The Neo Charge case stores enough power to fully refill up to four Neo Charge batteries on the go (not compatible with Neo Infinity batteries). 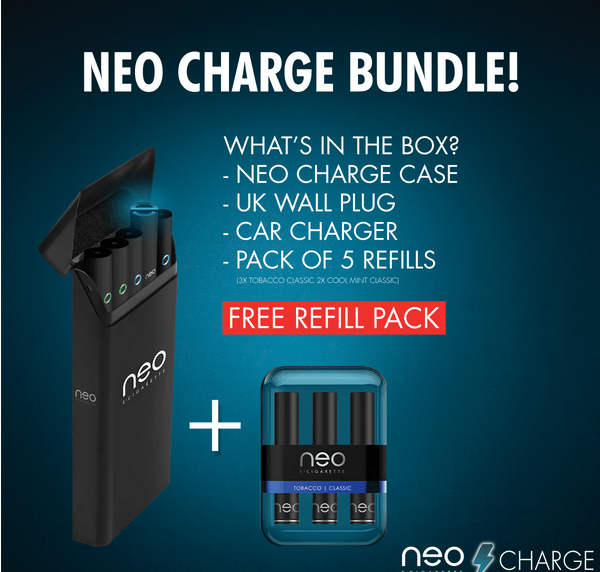 Neo Charge Bundle: 1X UK/EU Wall Plug | 1X Dual USB Car Charger | 1X Extra Pack Of 3 Refills Free Of Charge. A perfect gift for people who are trying to quit smoking, and looking for other alternatives. The competition is open to all UK residents over 18, and will run till the 29th of May. Good luck! The competition is now finished, and the lucky winner was @karlfoxley… 🙂 We are in touch!